Aurorus in game: 582 Who? Important notice! 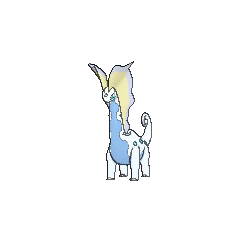 Pokemon Aurorus is a fictional character of humans. 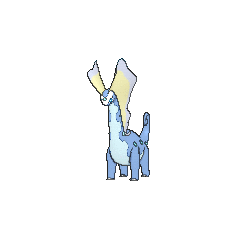 Aurorus (Japanese: ????? 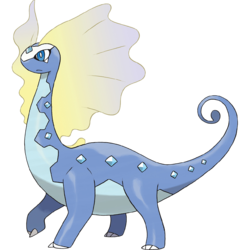 Amaruruga) is a dual-type Rock/Ice Fossil Pokémon introduced in Generation VI. 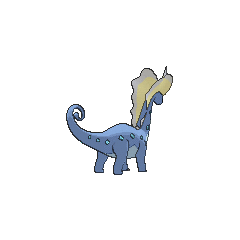 Aurorus is a quadruped, dinosaurian Pokémon that is similar to sauropods. It is primarily blue with a lighter underside. There are two lines of small ice crystals running the length of its body, one line on each side. These crystals produce freezing air reaching temperatures of -240 degrees Fahrenheit. 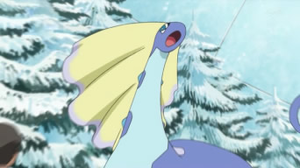 Aurorus uses this ability to compose ice walls for protection. A white, V-shaped mark covers the top of its head with another ice crystal in the center, giving it the appearance of wearing a tiara or a headress. Two large, flowing sails extend from the top of its head and run down its long neck. The sails are pale whitish-yellow at the base, and fade into a pale bluish-purple at the edges. There are three clawed toes on its hind legs, but one large nail and a single claw on its forelegs. The tip of its long, tapering tail is teardrop-shaped and curls inward. Aurorus made its debut in Coming Back into the Cold! 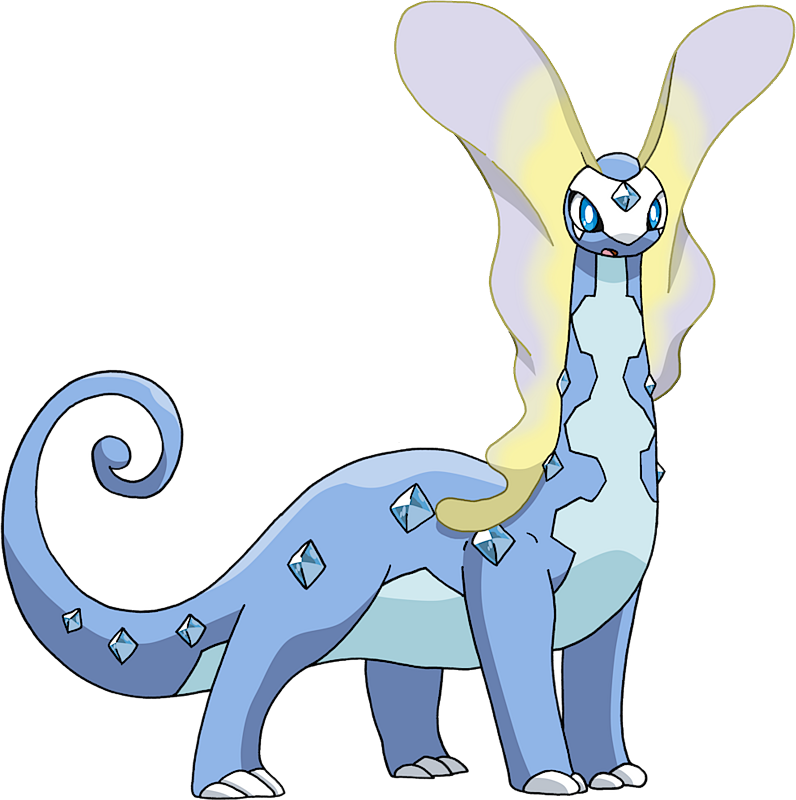 alongside its pre-evolution, Amaura. Aurorus also appeared in the newspaper in To Find a Fairy Flower!. In Shooting Frogadier, Grant owns an Aurorus. 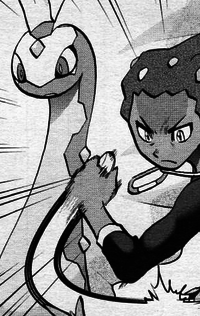 After several minor appearances, it was used in the attempt to stop the Ultimate weapon from activating. Using its diamond-shaped crystals, it can instantly compose a wall of ice to block an opponent's attack. 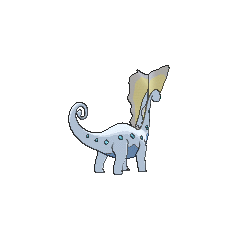 Aurorus is based on an Amargasaurus, which were speculated to have possible skin sail extensions on their vertebral spines. It also shares traits with various species of Diplodocoidea. The color-changing sails are also based on auroras, most likely aurora borealis due to its partial Ice typing, and the fact it only evolves at night, when the aurora borealis is most often seen. Similar to Tyrantrum, considering its white, V-shaped mark with an ice crystal covering the top of its head and two flowing extended sails running down its neck, it may have also been based upon a queen, with the mark and the two flowing sails acting as a tiara or a headress worn by queens from medieval times while its body with small ice crystals resembles a dress.